January 20th is Cheese Lover’s Day. Now, seriously, is there anything better than cheese? Is there any other food that is so integrated into the American lifestyle? Nearly every type of cheese is a candidate for freeze drying. Shredded cheese is light as a feather, easy to rehydrate with a mist bottle, and incorporates into recipes in its dried state just as easily as the moist version. Grated cheese is much cheaper to make at home than purchase. Thin slices or cubes make a great snack. They are a great addition to a lunchbox, snack plate, or salad. The uses are unlimited. Because they require no refrigeration, they are truly versatile, and there is no need to seek an ice pack or refrigerator. For a fun burger choice, seal two patties around a piece of freeze-dried cheese. As it rehydrates and melts, it absorbs the meat juices, which makes an extremely flavorful cheeseburger. For another taste variation, either seal blue cheese into the burger, or simply mix into the meat before plopping on the grill. 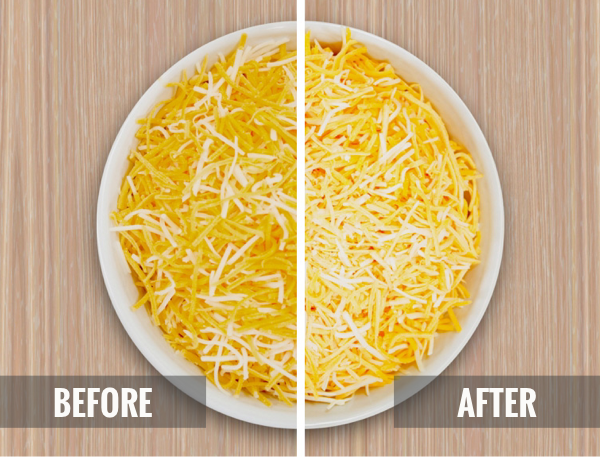 If your family loves cheese, but you don’t get it used up fast enough, freeze drying is a great way to preserve it. Nothing is more disheartening than going into the refrigerator and finding that your cheese is ruined. The hard part will be staying out of it once you freeze dry it! The flavors are so compounded and intensified that snacking often results in an empty jar. On second thought, the only thing more disheartening than going to the fridge and finding ruined cheese is going to the freeze-dried stash, and finding that someone else in the family got to it before you did. Mylar bags and code words may be helpful. Labeling such as “Mystery dairy product” may help deter cheese thieves. Or, just freeze dry a whole lot of it, and enjoy it! Happy Cheese Lover’s Day from Harvest Right! i love this idea. did not think to do this. Will definitely try the hamburger with cheese sealed inside. i bet that will be awesome and probably easier than working with normal cheese for the same application. Storage for cheese using jars? Is that an issue, since it would be opened often?